The first step in the DQM data qualification process is to create a DQM event. 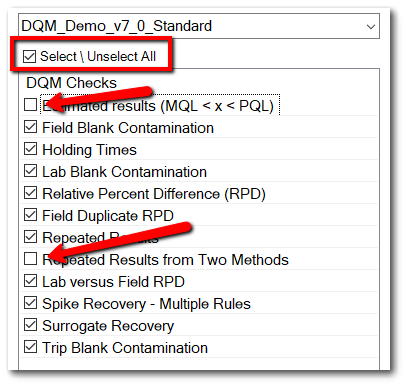 For each DQM event, the analytical data sets requiring qualification and the DQM QAPP specific checks must be selected. 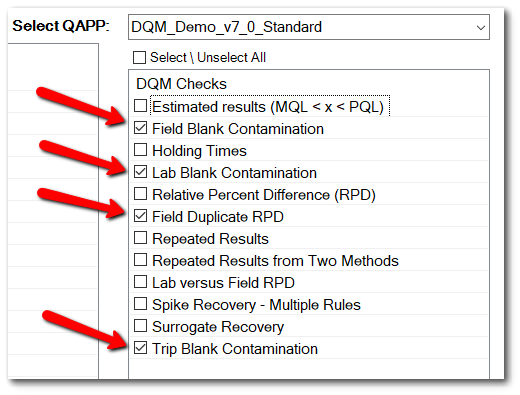 During the Create Event step, the automated checks for the selected DQM QAPP are run and DQM adds several new columns to the Analytical Results output table, including DQM_QUALIFIER, DQM_REMARK, APPLY_QUALIFIER and APPLY_REMARK. When DQM discovers an exception to a DQM rule, both QUALIFIER columns are populated with that rule's qualifier. The DQM_QUALIFIER and DQM_REMARK columns cannot be edited to preserve a record of the DQM suggested qualifier. Once the DQM event is created, the review continues with Processing a DQM Event (the next step in the DQM data qualification process). 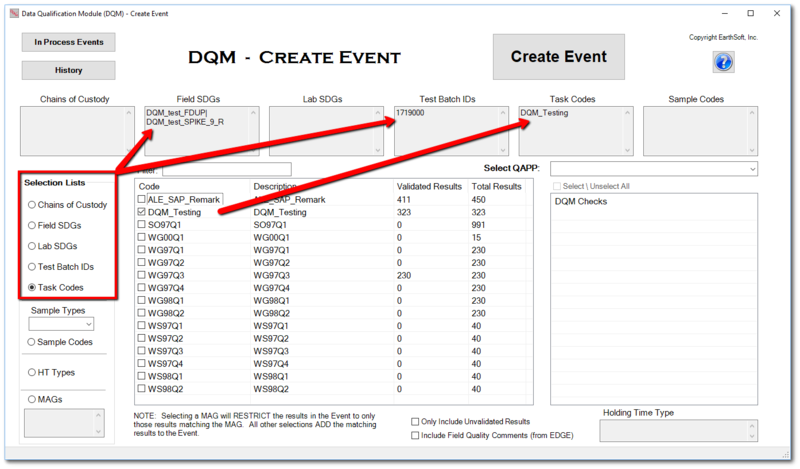 Click the DQM Create Events button on the Data tab. This will open the DQM - Create Event form. When one of the radio buttons is selected, all available data sets pertaining to that option will display in the selection pane. At least one data set must be selected from the list above to create a DQM event. Multiple data sets of each type can be selected. Data sets from different types can be incorporated into the same DQM event. As analytical data sets are selected, their identifiers will appear in the boxes on the form that correspond to the data type. This provides a summary of all the data sets selected. Note: Unlike most other EQuIS reports, these selections are additive. Therefore, when multiple selections are made, the DQM event will include samples that have one OR another of the selections, not just the samples that have all of them. (This does not include the optional MAG selection, which behaves in the typical EQuIS report selection manner of excluding all results that are not in that Method Analyte Group). Select the desired option(s) from the Selection Lists and then click the check boxes for all the data sets that are needed for the data qualification event. If numerous data sets are available in the selection pane, the Filter List text box can be used to find the desired data set(s). The filter defaults to the "Starts With" operator, but entering the wild card asterisk (*) as the first character changes the filter operator to "Contains". Individual samples can also be added to the Event dataset. Selecting one or more Sample Type(s) will restrict the selection list of Sample Code(s). An example of when this feature might be used is when a Trip Blank is needed to qualify a Field SDG that does not include that trip blank. 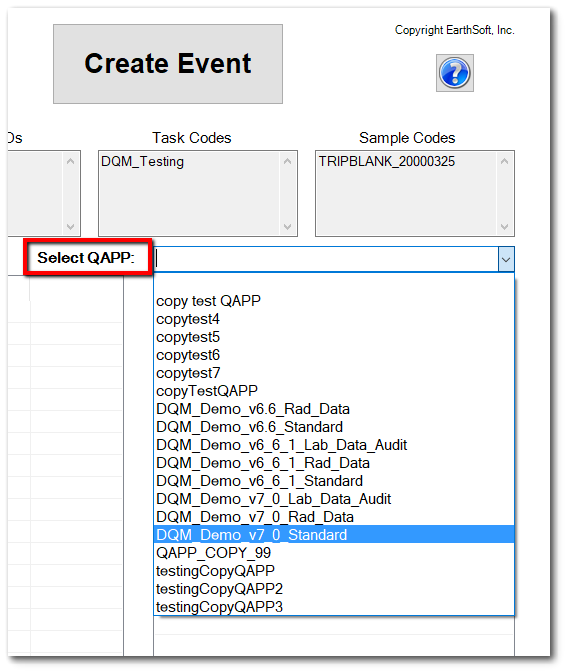 Click the Select QAPP drop-down to select the DQM_QAPP_CODE group to run checks from. Click the check boxes to select one or more checks to run. or click the Select All check box and run all checks or de-select some checks. If Holding Time (HT) is one of the selected DQM checks, then the HT Types radio button must also be selected and then click the check boxes to select desired HT types. The selected HT types will appear in the Holding Time Types text box beneath the DQM Checks frame. Checking the Only return Unvalidated Results check box restricts the event to results with DT_RESULT.VALIDATED_YN = 'N'. Checking the Include Field Quality Comments check box adds a Field Quality Comment column to the Review Samples > SAMPLES table output, and populates it from DT_SAMPLE_PARAMETER.PARAM_VALUE where PARAM_CODE = FieldQualityComment. (These DT_SAMPLE_PARAMETER records are created by EDGE when a Field Quality Comment is added during field data collection). Click the Create Event button to create the DQM Event. When the qualification finishes, the DQM Event Review form opens to allow the user to Process a DQM Event.